About | Products | Contact Handcrafted in the U.S.A. 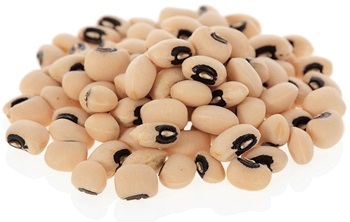 Eating black-eyed peas on New Year's Day is a Southern tradition in the United States. This tradition is based on folklore claiming that cooking a pot of black-eyed peas on New Year's Day will bring blessings of money and prosperity to the household throughout the year. It is a cherished part of Southern heritage, one that each generation of longtime Southerners pass down to their children to carry on. Many American families practice this tradition, and it is a beautiful way to remember our ancestors—regardless from which country or century they arrived to America. Every year, without fail, my mother from North Carolina cooked a pot of black-eyed peas on New Year's Day; and every year, my father Noah Belew from Tennessee (who is now in his 90s) telephones me early on New Year's morning offering his good wishes, always sure to mention the "mess o' black-eyed peas" he has cooking on the stove (click here for my father's favorite black-eyed pea soup recipe). Cooking the beans on New Year's Day continues to connect me with my family's American heritage, which dates back to the early 1700s in the Carolinas and Tennessee through records of Renny Belue. I like to remember my ancestors while preparing the beans—thanking them for all they did in their lifetimes. The black-eyed pea leaf in your pendant came from the lucky bean I planted on New Year's Day. While preparing my traditional pot of lucky black-eyed peas, a sudden inspiration came to mind: I examined the beautiful design, which nature provided to the bean, and thought about the miracle of its growth with just a few drops of water and a little sun. So, I decide to save one bean for planting, to bring life from one of those beans. Within a few days, the lucky bean was sprouting! 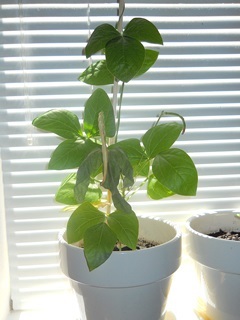 The plant grew beautiful leaves, pods full of beans, and interactive vines that coiled around objects nearby, reaching nearly four feet tall in my kitchen. For six months, I watched the beautiful plant grow and produce until it was time to harvest. It was a magical experience. After harvest, I couldn't imagine throwing away the leaves, or losing them into the soil. I watched each lucky leaf grow toward the sun. Those leaves were special, full of ancient blessings, each one a lucky charm. I decided to save the lucky leaves. I wanted to share their luck with others, but I wasn't sure just how to do it. Then, I was inspired again. I realized that I could preserve the leaves by adding them to the faces of pendants. I am a believer in God and life unfolding at just the right time, bringing blessings and interconnectedness between all living things. It is beautiful to believe that if you possess one of these lucky black-eyed pea pendants, you are part of the plant's journey. You are connected to the lucky black-eyed pea, and to all those who share in the celebration of these leaves. Each pendant holds within it a connection to the lucky bean, the intentions of prosperity and connectedness, luck, love, and inspiration; blessings from American ancestors and American traditions for you to carry and treasure all through your life. There is research dating back 2,000 years describing cultures who celebrated lucky black-eyed peas. Nature’s artistically designed little bean has a long history of bringing good luck, and wearing one of these lucky pendants honors a cherished Southern tradition, as well as continuing the ancient practice of celebrating one of nature's most beautiful creations! Thank you for visiting Belue Charms! In a 5-quart Dutch oven cook bacon until crisp and drain on paper towels. Cook onion, celery, and garlic in bacon drippings until tender, then add broth, salt, pepper, crumbled bacon, and peas. Bring to a boil, then lower heat to simmer. Adjust seasonings to taste, cover and simmer until peas are tender, about 1 hour. Belue Charms - Handcrafted in the U.S.A.